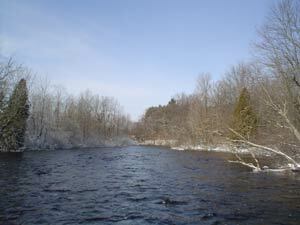 The White River is located in Newaygo, Oceana and Muskegon counties, in west central lower Michigan. The White River rises from the extensive Oxford Swamp in north central Newaygo County and flows in a southwesterly direction into White Lake then Lake Michigan, near the towns of Whitehall and Montague. The White River system drains a surface area of approximately 300,000 acres and includes about 253 linear miles of streams. White River and its tributaries offers some of the best salmon and lake trout fishing in the world.